May is recognized each year as National Arthritis Awareness Month. Arthritis is a disease that impacts more than 50 million Americans, making it the No. 1 cause of disability in the country. That means one in every five adults, 300,000 children and countless families are affected by different forms of arthritis. Clinical experience has demonstrated the effectiveness of ColciGel in mitigating the symptoms of acute flares. ColciGel patients report a 50% or greater decrease in pain and inflammation within a few hours and improved pain relief with additional applications. Oral colchicine, on the other hand, is effective in only 38% of patients treated for acute flares. Moreover, oral colchicine is associated with poor tolerability due to a high rate of gastrointestinal effects, typically nausea, vomiting, abdominal cramps and diarrhea. ColciGel is well tolerated and, because it is transdermal, avoids the commonly associated adverse effects associated with oral formulations of colchicine. Less common but more significant is a strong potential for drug-drug interactions with oral colchicine as it is metabolized and transported by hepatic cytochrome P450-3A4 and P-glycoprotein. Numerous other medications utilize this enzymatic pathway and transport system and can displace colchicine causing elevations in serum concentration to potentially toxic levels. Fatalities have occurred from these drug-drug interactions with oral colchicine. ColciGel, due to the topical application of a significantly lower dose of colchicine, has demonstrated only sub-clinically relevant systemic absorption, serum levels less than 50 pg/mL. This is a 100-fold lower peak concentrations of colchicine than that reported for oral colchicine (about 6 ng/ml or 6,000 pg/ml) thereby significantly reducing the potential for drug-drug interactions. The drug costs for the two treatments are very similar; however, oral colchicine therapy has the potential for large hidden costs associated with poor tolerability, serious adverse events (AEs), drug-drug interactions (DDIs), and treatment failures. ColciGel, without these hidden costs, should be a much more cost-effective treatment. From 2001 to 2004, employees with gout incurred almost double the direct annual health care costs per year compared to employees without gout ($6,870 versus $3,705). With over 8 million people with gout in the U.S., the extra health care costs for people with gout are likely to be over $20 billion per year. Moreover, these costs are growing and are expected to be significantly higher in 2016. All cause-direct costs related to gout have been estimated to be between $11,080 and $13,170 per year per individual. Indirect costs related to gout are estimated to be as high as $4,341 per individual. A key contributing factor to the indirect costs is that employed individuals with gout miss more work days than individuals without gout. In 2008, there were 174,623 emergency room visits in the U.S. where the primary cause for the visit was gout, with the cost of these visits reaching $182 million. An estimated 7 million ambulatory visits occurred annually in the U.S. associated with gout between 2002 and 2008, with total ambulatory costs associated with gout estimated at $933 million. The recommended treatment for Colcrys is 1.2 mg (two pills, 0.6 mg each) at first sign of flare and 0.6 mg (one pill) one hour later, for a total of three pills total per treatment. This can be repeated on the second day. The cost of drug is approximately $6.00 per pill, so the range of costs (three to six pills) for treatment of a flare is $18 to $36. AEs from oral colchicine will contribute to the cost of treating patients with acute flares. Some AEs will warrant other medications (to treat diarrhea, for example), and some AEs will lead to office visits or other care. The percent of patients with side effects is quite high, with the high dose (80%) and still significant with the low dose. Previous experience with these AEs can result in patients avoiding oral colchicine usage altogether at the early stages of a flare, opting for self-treatment with over-the-counter medications, such as NSAIDs, which can result in other AEs and treatment failure. Severe AEs can occur with oral colchicine, particularly those that occur because of DDIs. The costs of AEs that could arise from DDIs could be very high. Although a dose-reduction algorithm has been devised to reduce the risk of these DDIs, there are a large number of potential drugs that can induce DDIs with oral colchicine. Thus, there is a real potential that serious DDI cases will arise with the use of oral colchicine. Numerous deaths have occurred because of DDIs involving colchicine. A study at a veterans hospital is illustrative of the costs that could arise from adverse drug reactions including DDIs. This study found that 12.6% of all ER visits were related to pharmaceuticals, and 33% of those events (4.2% of total ER visits) were due to adverse drug reactions. The adverse drug reactions were either side effects of the drug, allergic reactions to the drug or DDIs. Hospitalizations occurred in 35% of all drug-related ER visits (4.4% of total ER visits), and these hospitalizations lasted an average of 9.3 days. The average cost in the U.S. of a hospital room was $1,625 in 2010. The 9.3-day hospitalization caused by adverse drug reactions would cost an average of $15,112, and that would not include other medical costs such as physician fees, tests and treatments. 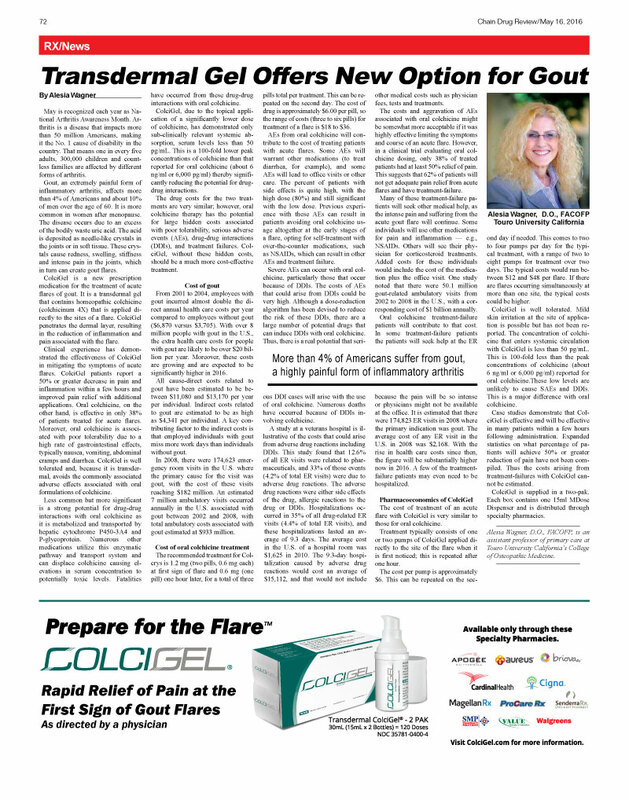 The costs and aggravation of AEs associated with oral colchicine might be somewhat more acceptable if it was highly effective limiting the symptoms and course of an acute flare. However, in a clinical trial evaluating oral colchicine dosing, only 38% of treated patients had at least 50% relief of pain. This suggests that 62% of patients will not get adequate pain relief from acute flares and have treatment-failure. Many of these treatment-failure patients will seek other medical help, as the intense pain and suffering from the acute gout flare will continue. Some individuals will use other medications for pain and inflammation — e.g., NSAIDs. Others will see their physician for corticosteroid treatments. Added costs for these individuals would include the cost of the medication plus the office visit. One study noted that there were 50.1 million gout-related ambulatory visits from 2002 to 2008 in the U.S., with a corresponding cost of $1 billion annually. Oral colchicine treatment-failure patients will contribute to that cost. In some treatment-failure patients the patients will seek help at the ER because the pain will be so intense or physicians might not be available at the office. It is estimated that there were 174,823 ER visits in 2008 where the primary indication was gout. The average cost of any ER visit in the U.S. in 2008 was $2,168. With the rise in health care costs since then, the figure will be substantially higher now in 2016. A few of the treatmentfailure patients may even need to be hospitalized. The cost of treatment of an acute flare with ColciGel is very similar to those for oral colchicine. Treatment typically consists of one or two pumps of ColciGel applied directly to the site of the flare when it is first noticed; this is repeated after one hour. The cost per pump is approximately $6. This can be repeated on the second day if needed. This comes to two to four pumps per day for the typical treatment, with a range of two to eight pumps for treatment over two days. The typical costs would run between $12 and $48 per flare. If there are flares occurring simultaneously at more than one site, the typical costs could be higher. ColciGel is well tolerated. Mild skin irritation at the site of application is possible but has not been reported. The concentration of colchicine that enters systemic circulation with ColciGel is less than 50 pg/mL. This is 100-fold less than the peak concentrations of colchicine (about 6 ng/ml or 6,000 pg/ml) reported for oral colchicine. These low levels are unlikely to cause SAEs and DDIs. This is a major difference with oral colchicine. Case studies demonstrate that ColciGel is effective and will be effective in many patients within a few hours following administration. Expanded statistics on what percentage of patients will achieve 50% or greater reduction of pain have not been compiled. Thus the costs arising from treatment-failures with ColciGel cannot be estimated. ColciGel is supplied in a two-pak. Each box contains one 15ml MDose Dispenser and is distributed through specialty pharmacies. Alesia Wagner, D.O., FACOFP, is an assistant professor of primary care at Touro University California’s College of Osteopathic Medicine.